"There’s a distinct live feel about many of these recordings and some virtuoso performances. 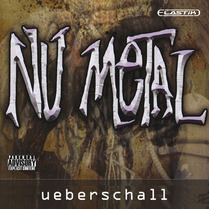 (...) 8 out of 10"
Nu Metal is a two-CD (audio and .WAV file) collection put together by Ueberschall. If the only metal you’re familiar with is the heavy kind, you’ll doubtless be confused by new alloys such as death, speed, and nu metal. As far as the latter is concerned, we’re still very much in the area of guitar-led, distortion-fuelled music, but the tempos are slightly lower and there’s considerably more emphasis on experimentation, with bands often featuring DJs, multiple vocalists and non-guitar-based musicians. All of the above is reflected in this collection. Far from simply presenting one high-octane guitar riff after another, it offers some genuinely innovative material from every instrument in the typical nu metal line up – and a few untypical ones. There’s a distinct live feel about many of these recordings and some virtuoso performances. However, I think you have to question who this collection is aimed at: few nu metal outfits will be content using guitar samples rather than the real thing. That said, if you could find a way of accommodating this you could be well on the way to creating something new.